Tokens of the Past is a continuing pattern series featuring several small, doll size quilts, wall hangings or table toppers. 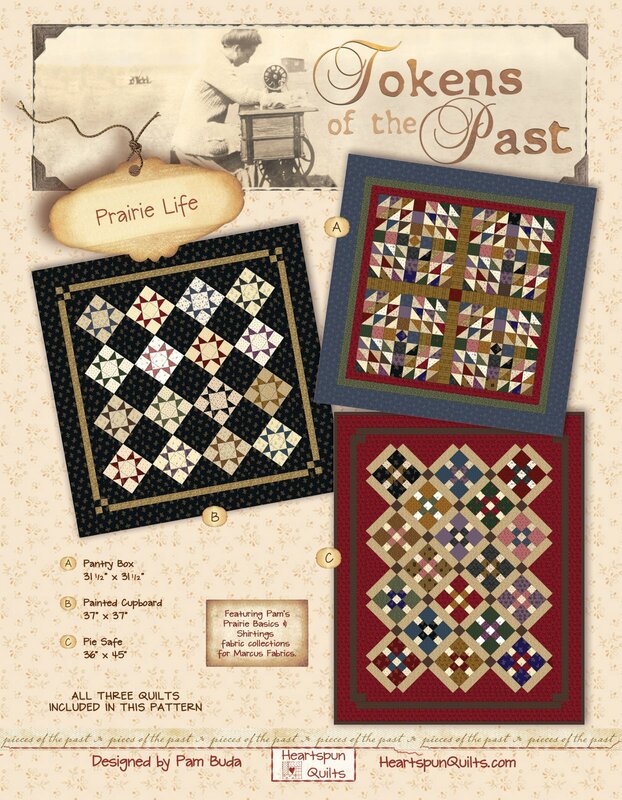 Prairie Life is the seventh pattern in the series, and features three, new quilts all made from Pam's Prairie Basics & Shirtings fabric collection by Marcus Fabrics. I made all of the units and blocks for all three quilts from just one Prairie Life 10 x 10 precut!! Quilt sizes are as follows: Pantry Box 31.5" x 31.5", Painted Cupboard 40" x 40", and Pie Safe 36" x 45"
A limited number of kits for the Prairie Life quilts are available now!! If you're interested, look for them here on my website under the PRODUCTS> Pam's Fabric> Kits category.